By entering and using this website ('Website') you are fully accepting the terms, conditions and disclaimers contained in this notice. If you do not accept these Terms and Conditions you must immediately stop using the Website. The information on the Website has been included in good faith and is for general purposes only. It should not be relied upon for any specific purpose and no representation or warranty is given as regards its accuracy or completeness or for making any decision. In order to use certain features of this Website, you are required to login as a member ('Member'), the details of which are provided in the registration form. If you apply for any product or service detailed on this Website, these Terms and Conditions should be read in conjunction with and in addition to any other terms and conditions which relate to any such product or service and, in the event of any contradiction between these Terms and Conditions and the specific terms and conditions relating to such product or service, the latter shall prevail. Tata Motors Limited reserves the right to: a) change or remove (temporarily or permanently) the Website or any part of it without notice and you confirm that Tata Motors Limited shall not be liable to you for any such change or removal b) change, remove or discontinue any service, promotion etc. as advertised on this Website at any time without notice and you confirm that Tata Motors Limited shall not be liable to you for any such change or removal c) change or discontinue any promotional material at any time without notice and you confirm that Tata Motors Limited shall not be liable for any such change or removal d) change these Terms and Conditions at any time without any notice or assigning any reason therefor, and your continued use of the Website following any changes shall be deemed to be your acceptance of such change. This Website is for personal use only. While Tata Motors Limited has taken care in the preparation of the contents of this Website, this Website and the information, names, images, pictures, logos, icons regarding or relating to Tata Motors Limited and/or its corporate parents, subsidiaries, affiliates etc. or the products and services of the same , are provided on an "as is" basis without any representation or endorsement being made and without any warranty of any kind, whether express or implied, including by not limited to, any implied warranties of satisfactory quality, fitness for a particular purpose, non-infringement, compatibility, security and accuracy. To the extent permitted by law, all such terms and warranties are hereby excluded. In no event will Tata Motors Limited or any of its corporate parents, subsidiaries, affiliates etc. be liable (whether in contract or tort (including negligence or breach of statutory duty) or otherwise) for any losses sustained and arising out of or in connection with the use of this Website including, without limitation, loss of profits, loss of data or loss of goodwill (in all these cases whether direct or indirect) nor any indirect, economic, consequential or special loss. If any of these Terms and Conditions (or any terms and conditions relating to a product or service referred to in this Website) should be determined to be illegal, invalid or otherwise unenforceable by reason of the laws of any state or country in which such terms and conditions are intended to be effective, then to the extent of such illegality, invalidity or unenforceability, and in relation to such state or country only, such terms or condition shall be deleted and severed from the rest of the relevant terms and conditions and the remaining terms and conditions shall survive, remain in full force and effect and continue to be binding and enforceable. The Website, inclusive of all material contained therein, may include links to third party websites that are controlled and maintained by others. Any link to other websites is not an endorsement of such websites and you acknowledge and agree that Tata Motors Limited is not responsible for such content or availability of any such websites. Use of such third party websites shall be at your own risk. The Intellectual Property Rights in this Website and the materials on or accessible via it belong to Tata Motors Limited or its licensors. This Website and the materials on or accessible via it and the Intellectual Property rights therein may not be copied, distributed, published, licensed, used or reproduced in any way (save to the extent strictly necessary for, and for the purposes of accessing and using this Website). 'Tata Motors Limited' and the trademarks belonging to Tata Motors Limited may not be used, copied or reproduced in any way without written consent from Tata Motors Limited. For these purposes 'Intellectual Property Rights' includes the following (wherever and whenever arising and for the full term of each of them): any patent, trademark, trade name, service mark, service name, design, design right, copyright, database right, moral rights, know how, trade secret and other confidential information, rights in the nature of any of these items in any country, rights in the nature of unfair competition rights and rights to sue for passing off and other similar intellectual and commercial right (in each case whether or not registered or registrable) and registrations of and applications to register any of them. Tata Motors Limited retains and reserves all rights in such Intellectual Property Rights. Tata Motors Limited makes no warranty that the functionality of the Website will be uninterrupted or error free, that defects will be corrected or that the Website or the server that makes it available are free of viruses or anything else which may be harmful or destructive. You agree to indemnify and keep indemnified always and hold Tata Motors Limited and its employees and agents harmless from and against all liabilities, legal fees, damages, losses, costs and other expenses in relation to any claims or actions brought against Tata Motors Limited arising out of any breach by you of these Terms and Conditions or other liabilities arising out of your use of this Website. No ideas, material, computer code, information or other communication you submit or post to the Website will be considered confidential or proprietary. All such material becomes the exclusive property of Tata Motors Limited, which is entitled to use such material for any purpose without restriction or compensation. You are prohibited from posting or transmitting to or from the Website any unlawful, infringing, threatening, libelous, defamatory, obscene or pornographic material or any other material that would violate any law and Tata Motors Ltd. reserves the right to delete such material without giving any notice. Tata Motors Ltd. reserves the right to block such user/ Member from entering the website permanently. Views expressed or comments offered by the users/ members shall be personal in nature of the users/members and Tata Motors Ltd. shall not have any responsibility whatsoever in this regard. In the event that any provision of these Terms and Conditions is declared by any judicial or other competent authority to be void, voidable, illegal or otherwise unenforceable or indications of the same are received, Tata Motors Limited reserves the right to amend the same to subserve the intent and purpose of that particular provision, which when amended shall be binding on you. The remaining provisions of these Terms and Conditions shall remain in full force and effect and binding upon you. If there is any dispute about or involving these Terms and Conditions, the Website and/or the service/products between you and Tata Motors Limited, the dispute shall be governed by the laws of India and the courts of Mumbai alone, to the exclusion of any other, shall have the jurisdiction to try and entertain any disputes. With respect to the global nature of the Internet, you shall comply with all local laws/rules regarding user conduct on the Internet and acceptable content. You acknowledge and agree that Tata Motors Limited may preserve any materials submitted or posted by you (including e-mails, profiles, postings or other content) and may disclose such material if required to do so by law or in the good faith belief that such preservation or disclosure is reasonably necessary to: (1) comply with legal process; (2) respond to claims that any material violates the rights of third parties; or (3) in our sole judgment protect the rights, property or personal safety of Tata Motors Limited, its Member, employees or the public. These Terms and Conditions together with any documents expressly referred to in them, are the terms and conditions relating to the subject matter covered for the use of this Website. Tata Motors Limited reserves the right, at any time and without prior notice, to remove or cease to supply any product or service contained on this Website or remove any material posted on this website at its sole discretion. In the event that such a removal takes place, Tata Motors Limited shall not be liable to you in any way whatsoever for such removal. Tata Motors Limited reserve the right to change these Terms and Conditions at any time by posting changes on the Website without prior notice and the same shall be binding upon you. 'Customer' means a Prospective customer interested in online booking of Tata Harrier and includes any Individual / Firm / Proprietorship / Company etc. 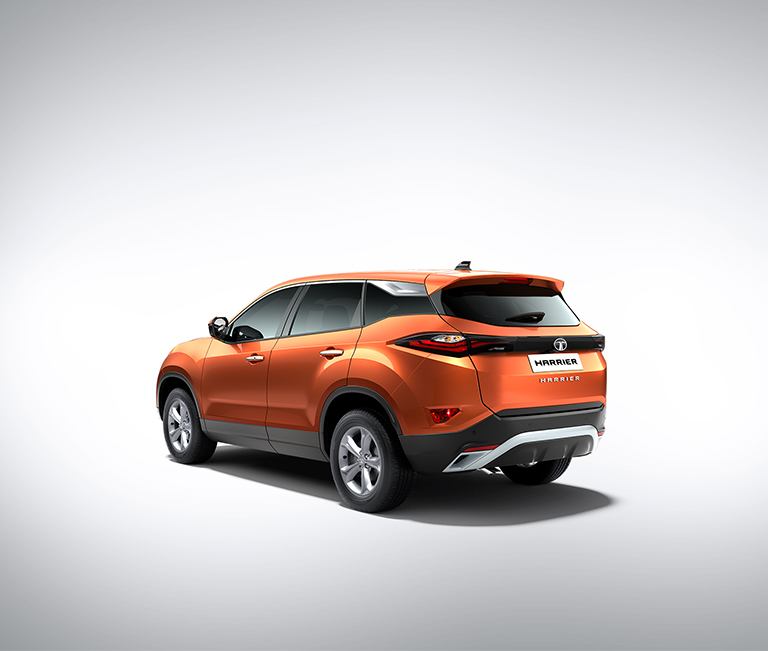 The online booking system will facilitate the prospective customers in faster booking of Tata Harrier in a secured environment and at their convenience. Booking is allowed only with authorized DEALER'S of TML as mentioned in this website. Customer would need to visit the dealer post launch to confirm the model variant and color of choice. The Customer/s is requested to thoroughly read and understand specifications, features of Tata Harrier posted in http://www.Tata Harrier.tatamotors.com before making their choice. Tata Harrier will be available in variants in petrol and diesel versions. A customer may book one or more Tata Harrier and the customer will be required to pay booking amount of Rs. 30,000/- for booking of each Tata Harrier booked online. This booking amount will be directly transferred to the bank account of the Dealer selected by the Customer. The price, specifications and features of Tata Harrier are subject to change without prior intimation and at the discretion of TML. Its optional for the customer to book online, Customer may opt for booking the car from dealership after the launch. Acceptance of online booking payment is taken on behalf of the Dealership by Billdesk (hereinafter referred to as 'Agency'). The online booking engine is available at https://harrier.tatamotors.com/bookonline whereas payment gateway is powered by Agency. Payments made by the customer for online booking of Tata Harrier through payment gateway agency are subject to the terms and condition as provided by the respective agency. TML or its Dealers would not be responsible for any non-payment or wrong payment made in respect of the booking through the agency. The booking amount for Tata Harrier will be displayed on the payment gateway site once the Customer makes choices such as Dealership, State, City. The Booking amount can be paid online using debit card / credit card / Internet banking. Customer would need to visit the Dealership post launch to confirm his/her exact variant. The customer shall pay or arrange to pay the dealer the balance amount of the Tata Harrier to complete the successful purchase process of the car. The balance amount shall be paid by the customer before the delivery commitment date given by dealer. Dealer is not liable to make deliver to the customer till full payment of the car made by customer. Processing fees for booking amount paid by the customer will be borne by Dealer, but only in case where the booking is getting converted into a successful sale. The Customer needs to provide accurate information while filling the form online and will be required to submit documents as specified by the Dealers including PAN card, Address proof, Driving license and other documents as specified by the Dealer for completing the booking / subsequently sale / cancelation / refund of the booking amount. All document originals will need to be produced at the time of taking delivery of Tata Harrier. In case Customer does produce any of the above-mentioned proofs, they should submit copy of any other valid photo identity proof duly attested by a gazette officer and mention the details of the same on the form. For online payment, the details are to be filled at the relevant section and will have to be produced at the time of delivery. If the Customer fails to comply with these conditions, the Dealer with whom the order is placed reserves the right to deny the delivery of the Tata Harrier. Any information of the Customer may be shared with the government if any authority calls upon TML to do so, or as may be prescribed under applicable law. After online submission of the form and a valid online payment transaction, the system will generate a booking reference number for the receipt of payment towards the booking amount. The Customer shall use the booking reference number to communicate with the Dealership and for any future communication. Only after receipt of the full balance price of the car the booking will be binding. Until the full balance price of the car is received for the online booking is merely a request on part of the Customer and an indication of an intention to sell on part of the Dealer and does not result in a booking confirmation or contract of sale. Should the booking fail to be accepted for whatever reasons could not be completed there will be no financial implications to TML or the Dealer. Except for the refund and interest as per the terms mentioned herein. The Customer agrees that the Dealer shall not be deemed to have accepted the booking of the Customer or be bound by the booking until Dealership notifies the Customer of its acceptance of the booking within a period of 10 days. The booking is non-transferable and only the Customer booking online would be eligible to the buy Tata Harrier by making full balance price of the car payment if the booking is accepted and confirmed by the Dealership. Prices of the different variants of Tata Harrier variants would be revealed post launch. Post launch, the price shown online is the 'ex-showroom' price and is subject to statutory levies, insurance, etc. Purchase price of the car in question shall not include the cost of insurance, registration, handling, logistics or any other govt. levies if any. The final 'on-road' price can be availed at the nearest dealership on request and the prices may be subject to change on the date of delivery. By choosing to pay online towards the booking of the car the Customer agrees to abide by all the applicable laws including the local laws governing sale of cars. Any increase in the on-road price till the completion of deliveries to the customer caused solely and directly on account regulatory or other legal requirements shall be borne by the customer. The amount paid online by the Customer will be transferred to the Dealer as selected by the Customer within 48 to 72 hours from the receipt of online payment. The Customer may make further enquires if any with the selected dealer post 72 hours of online transaction. Delivery of the variant or color preference given by the Customer may be affected by production constraints. In case the Dealership is not able to match the preference of the Customer, The Dealer will alternatively OFFER to the Customer other available variant. Any differential amount applicable thereof will have to be borne by the Customer. Ex-Showroom price of the Tata Harrier will vary depending upon the variant and color choice and the city where the delivery is to be made. The customer is aware that at the time of booking the prices, colors and variants will not be disclosed by TML and thus if the customer decides to cancel the booking for the reason of expectations not being met, the cancellation process will be followed as per the mentioned agreement terms herein. The ex-showroom prices applicable to your city on date of booking will be available on the TML website post launch and dealership where delivery is intended to be taken. TML shall have the right to revise the specification, standard fitment and / or accessories for Tata Harrier or introduce new versions of the variants. Delivery of Tata Harrier is subject to availability at the selected dealership. In case of non-delivery of Tata Harrier the Booking shall be deemed as cancelled. The customer/s has to follow the cancelation / refund procedure as mentioned herein. Once the customer selects the variant and informs the dealer, the dealer shall within 7 days inform the customer about the expected delivery of the car within 10 weeks, which would also depend upon the variant, specifications and color selected by customer. Customer will be informed of payment receipt confirmation. The Dealership will not be responsible if delivery of the Tata Harrier is delayed due to any reason beyond its control. Expected Delivery of Car would be confirmed by the dealer on receiving the choice of variants by the customer. If delivery is delayed beyond 21 days from the tentative date of delivery intimated by the Dealer interest @10% on online booking amount will be paid by the Dealer from the date of delivery commitment. The Customer can also contact the Dealership indicated for the purpose of taking delivery. TML would not be responsible for delay/ non-receipt of communication by Customer due to incorrect address, given in the Online booking form or otherwise. Customers booking is liable to be rejected by the dealership in case of incomplete forms or non-receipt of booking amount, refunds incase of incomplete forms shall be made to the customer by the dealer within 15 days without interest applicable on such booking amount. The Dealership set out in the Online Booking confirmation as selected by the Customer during the online booking process will make delivery of Tata Harrier. TML reserves the right to change the Dealership for the purposes of the delivery of Tata Harrier. In the event of any unforeseen circumstance, Acts of God or Force majeure delivery period may be subject to change. This will be informed to the Customer directly by the Dealership or it's representing Agency. In such an event customer will not be eligible for any interest on the amount paid to the dealership during the online booking. The customer shall be free to cancel the booking upon receiving such intimation by the dealer. For cancellation customer need to send a mail to customercare@tatamotors.com, mentioning in the subject line Tata Harrier Cancellation. Refunds in case of cancelation by the Customer will be made within 21 days from the day of request of cancelation made by customer. Interest will be paid @10% in case the refund is delayed beyond 30 days from date of cancellation request. Booking, refunds, cancellations etc. will be governed by the terms and conditions of Booking / Sale as agreed upon with the dealership. Customer would need to collect the refund directly from the dealership subject to completion of cancellation formalities. There will be no liability to TML under any circumstances whatsoever. Customer need to mention their contact details and Billdesk Transaction ID, Reference ID, Sales Order Number and amount, in the mail for processing cancellation request and to get in touch with customer in case of any addition details are required to process cancellation request. TML may contact customer for cancellation request. TML has the right to change the terms and conditions of the offer without prior notice. TML or Dealership will not be responsible for delay, loss or non- receipt of online booking information or any other form of submission not contemplated herein. TML reserves the right to change the variants, variant names and specifications at its own discretion and will make reasonable efforts to keep the Customer informed before the completion of the sales process. TML or its Dealerships will not assume any liability for any inability or failure on their part in executing any order registered by any Customer on account of any causes, constituting a force majeure or otherwise, beyond their control. In event of demise of Customer, the booking / Allotment / retention stands cancelled and will be refunded as per refund terms mentioned, to the nominee on production of original documents as stated by dealership. In any case of dispute, inconvenience or loss, Customer agrees to indemnify TML and its Dealerships. Any dispute relating to enforcement, interpretation or application of these terms and conditions will be subject to Courts at Mumbai alone to the exclusion of all others. TML reserves the right to alter any terms and conditions or the process itself clause at its sole discretion as and when considered necessary. Reasonable efforts will be made to keep Customer informed as soon as possible. By BOOKING online via this website the customer/s accepts and agrees to the above terms and conditions. Non-acceptance of any of these terms and conditions will result in disqualification. The Booking under this scheme is optional and is initiated by TML solely to prioritize and for convenience of its serious/interested customers. Tata Harrier can be booked and purchased without booking from this website as well. The offer to purchase the car subject to T & C is optional. Customer may choose not to book the Tata Harrier in response to the offer. TML reserves the right to amend these Terms and Conditions and may withdraw or discontinue the offer without prior notice. TML, their directors, employees, dealers, consultants, assume no liability whatsoever for any direct or indirect loss or damage arising from an Applicants' applying for purchase the car as per the T & C. TML may terminate or withdrawal of the offer, change of Terms & Conditions or for any loss or damage, howsoever arising. The booking is completely voluntary for customers and entirely at their discretion. Customer's token deposit of Rs.30,000 /- paid by them at the time of booking will be adjusted against the price of the car at the time of purchase.